"OMM provide an excellent storage solution service." Your company stores information which could be a huge risk to your business in the wrong hands. According to the BBC Money Programme the cost of identity theft in the UK is approximately £1.7bn and increasing at the phenomenal rate of 500% a year. This has become the most costly security risk a business faces. 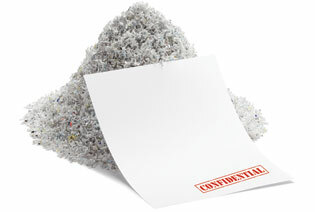 Is shredding a legal requirement? No, but taking the proper steps to secure information is. Every business has has to securely dispose of confidential information, including customer lists, client information, credit card receipts, personal files or payroll records. its vital to protect and secure information that could be used to steal identities. The Information Commissioner's Office (IOC) has the power to issue penalties up to £500,000 if a business is found in breach of a Dater Protection Act. Under this act, an organisation should not discard intact customer, staff or supplier information, and shredding offers the most environmentally friendly solution. Should we shred documents or outsource? Alternatively, we have over 80 shredders in our catalogue suitable for offices or any size. From home office to large heavy duty machines, and from basic security (A4 into 30 pieces) to maximum security ( A4 sheets 15,000 pieces), we have the right shredder for you. Many of the machines we supply take staples, paperclips and CDs to make life easier. We will identify the perfect shredder or option to meet your needs. In today's busy working environment, we've had an increased demand for our secure shredding solution. Introducing a secure shredding solution will reduce the number of important documents slipping through the net illegally and possibly into a waste paper bin. Get in touch to find out more about this service.